The Giver is a 2014 movie based on the book of the same title by Lois Lowry. It's one of those YA fiction novels about rebellion and teenagers or young adults who fight for what's right. There's The Hunger Games trilogy by Suzanne Collins, the Divergent trilogy by Veronica Roth and The Host by Stephenie Meyer. What's amazing, is how star-studded this movie is. 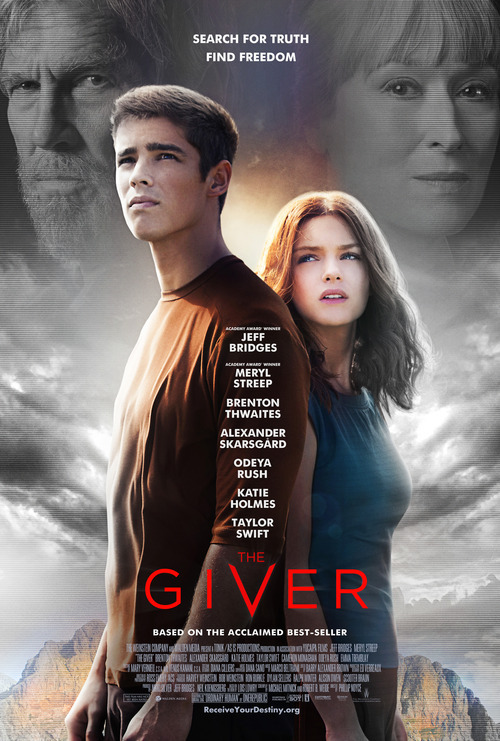 Featuring Jeff Bridges as The Giver, Meryl Streep as the Chief Elder (president), Brenton Thwaites as Jonas (the next "Giver"), Alexander Skarsgard as Jonas' Father, Katie Holmes as Jonas' Mother, Odeya Rush as Fiona (the love interest), Cameron Monaghan as Asher and Taylor Swift as Rosemary (The Givers' daughter) among others. As a non-reader of the book, I wasn't attracted nor interested in the movie at first. I'm not into YA fiction as well like The Hunger Games, Divergent, and this--so I figured, why bother watching the movie? When the boyfriend insisted that we watched it, I kind of protested, because I don't particularly like the movie. But when we started watching it, that's when I proved myself wrong! I may have liked this better than Divergent. I found this movie similar to Divergent, because of the division; similar to The Hunger Games, because of the conspiracy--but only to do what is right. I also found their way of clapping really weird, because why would you want to clap by tapping one hand to your one leg?! It looked really really weird... I also found Odeya Rush really pretty! Too pretty for Brenton Thwaites, I think. LOL. I loved how Taylor Swift's character is the twist in this story, and how everything revolves around what happened to her. Meryl Streep's acting is good too. I'm not even halfway through the movie when I found myself really hooked and concentrated in watching the movie. What's bothersome though, is the ending, because it was frustrating! I really hate open-ended stories--but I guess this one has a part II. I am soooo hoping!